Once again I had the honor of working out with our fit, famous and fabulous friend, Melissa Bender of Melissa Bender Fitness! We put together a bodyweight only workout to make you sweat, build strength, improve flexibility and hammer the crud out of your core. Below you will find “The 40 Min Power Yoga Core Flow w/ Melissa Bender and Sean Vigue”. Melissa and I believe in the power of bodyweight only fitness where we use the greatest gym ever invented, our body, to achieve physical and mental greatness. You’ll be amazed at how your body transforms in a short amount of time with these complete and intoxicating training sessions. Make sure you ‘check in’ in the comment section of the video (on YouTube) so we know you’re training with us and Share it with your fitness friends and family. Click here for our previous intense training encounter. Looking for the perfect stocking stuffer? 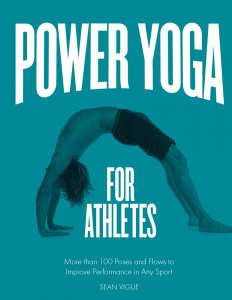 Order my bestselling book, Power Yoga for Athletes and be the greatest Santa Claus in history!